Thu., Aug. 3, 2017, 5 a.m.
Jocelyn Cook maintained a narrow lead over J. Scott Miller for the second spot on the general election ballot for Spokane County Superior Court and races in Medical Lake remained too close to call in ballots that were counted Wednesday. Cook has a lead of about 900 votes over Miller in the judicial race. Incumbent Tony Hazel finished first in the primary with 51 percent of the vote. 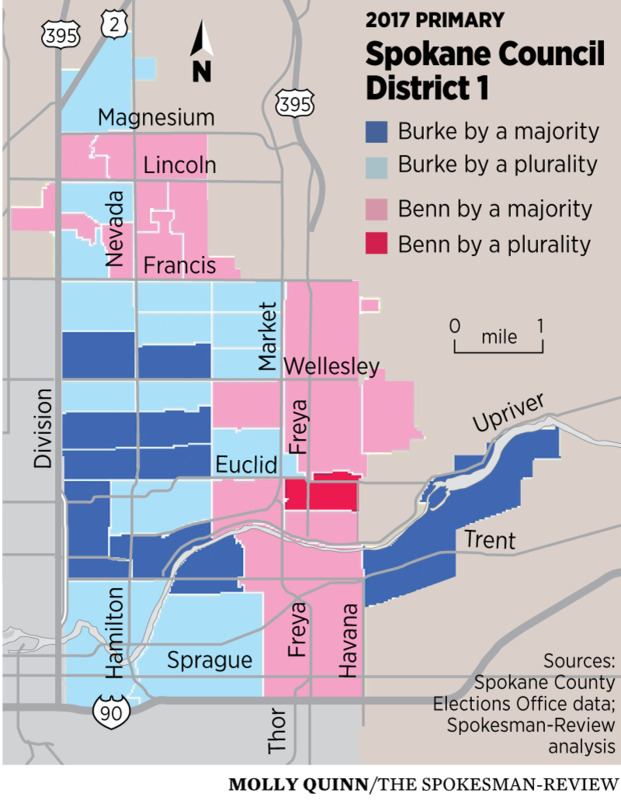 An analysis of votes in Spokane’s City Council District 1 race shows an east-west split between the top two vote-getters in the three-way primary. Kate Burke leads in many of the district’s west precincts close to Division Street, while Tim Benn has a plurality in precincts near the city limits. In Medical Lake, Shirley Maike finished first in the race for mayor, with Mikeal Suniga holding a 29 vote lead over Laura Parsons for the second spot. John Merrick is easily on top for the Position 2 spot, with Elizabeth Rosenbeck holding a 20 vote lead over Monica Manza for the second spot. Just five votes separate Tony Harbolt and Don Kennedy for the top spot in the race for Position 4, but both are so far ahead that Destiny Stein was eliminated in the primary. Theodore Olson will move on to the general election in the race for Position 5, but Gary Plumlee leads Michael Deeley by just 20 votes for the second spot. The elections office has about 9,000 votes from around the county left to count, and expects to run another batch of ballots Thursday. Published: Aug. 3, 2017, 5 a.m.